Dr. Rosalind Franklin: A life in discovery. 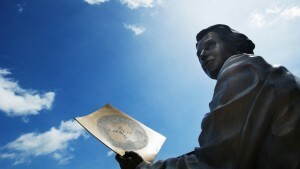 A statue of Rosalind Franklin, unveiled in May 2014, stands at the entrance to the university. It was created by Highwood, IL artist Julie Rotblatt-Amrany. Discover the legacy that inspires our university. More than half a century ago, scientists across the globe raced to discover the secret of life. 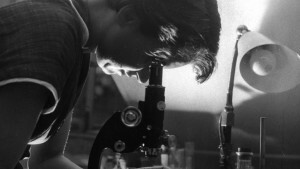 At the forefront of this effort was Rosalind Franklin, PhD, a brilliant British researcher who in 1952 painstakingly conceived of and captured "Photograph 51" of the "B" form of DNA. It is this photograph, acquired through 100 hours of X-ray exposure from a machine Dr. Franklin herself refined, that revealed the structure of DNA. In 2004, the university changed its name to honor Dr. Franklin, whose uncompromising honesty and devotion to the highest standards of scientific research and continues to inspire and guide our faculty, students, and alumni today. A life of inquiry and achievement. Dr. Franklin was born in 1920 and educated at a private school in London where she studied physics and chemistry at an advanced level from an early age—especially for a woman at that time. An excellent and dedicated student, she earned a PhD in physical chemistry in 1945 from Cambridge University. In 1952 while at King’s College in London, Dr. Franklin captured "Photograph 51" of the "B" form of DNA. The discovery of the structure of DNA was the single most important advance of modern biology, changing the future of health care forever. James Watson and Francis Crick, working at Cambridge University, used "Photograph 51" as the basis for their famous model of DNA, which earned them, along with scientist Maurice Wilkins, the 1962 Nobel Prize. Dr. Franklin went on to perform exceptional research at Birkbeck College before dying of ovarian cancer at age 37, without ever knowing the true magnitude of her contribution to the science of life. By honoring the legacy of Dr. Franklin, we honor the powerful aspirations of this university’s faculty, students, and alumni. Dr. Franklin’s legacy continues not just through a spirit of inquiry, discovery, and academic excellence evident on our campus, but also in our recognition and support of diversity in medicine and science.